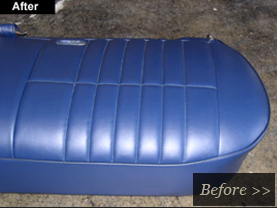 Economy Upholstery is Santa Barbara County's premiere upholstery service. With more than 25 years experiecnce we are skilled in comercial upholstery, including restaurant and office furniture, automotive upholstery, including seats, headliners, vinyl, and leather, and marine upholstery, including bimini tops, canvas, and vinyl. There is no need to drive to Oxnard or even Los Angeles when you have a first rate upholstery service located right here in Santa Barbara. We can custom design any cloth window treatment including draperies, valances, swags, cornice boards and Roman shades. We carry a complete warehouse of vinyl, leather, canvas and other cloths, and we can order just about anything yoou need!